Not every place you go will provide its own covered parking. If you do not expect to be there for any length of time, this should not cause you much alarm. However, if you plan to park your automobile or another vehicle somewhere for long stretches, it can provide peace of mind to know that it is covered and protected. That is where an aftermarket carport comes into play. Figuring out which carport best suits your needs can be time-consuming and confusing. That is why we have put together a list of the 5 best carports available for purchase aftermarket. Then we provide a helpful buyer’s guide, so you can make an informed decision about which carport is right for you. The first product on our list comes from Palram Vitoria. However, this carport is a bit of a mixed bag. There are definitely some things to like, but the carport also carries with it some limitations not found in the other models reviewed. First, this carport is easily the most durable on our list. As the only carport to feature a stiff, permanent roof, you do not have to worry about hail, limbs, or other debris tearing a hole in your canopy like with the other carports on our list. Moreover, the polycarbonate panels are also more resistant to water, sunlight, and extreme temperatures. When combined with a galvanized aluminum frame and steel posts, this carport is easily the most durable on our list. Furthermore, this is likely also the most user friendly carport on our list as well. It is designed with the explicit purpose of being installed by the owner, so you do not need to worry about hiring a professional to set it up for you. Moreover, the frame itself is built with embedded rain gutters to help prevent the area directly around the housed vehicle from flooding. Unfortunately, this is also the smallest carport on our list. At only 16 feet long, you will not have nearly as much clearance as with the other models reviewed. Moreover, while it is not exactly short, a maximum height of 8 feet is not one of the taller heights for carports on our list either. Ultimately, this carport is better suited for general consumer vehicles. Boats and even taller trucks are better served with a larger carport. However, you better be sure this is the one that you want, because it is also the most expensive carport on our list, many times over. The Quictent is a unique entry on our list in that it is designed to pull double duty. While you can easily use this product exclusively as a carport, it is in fact designed to be used for a whole host of purposes–many of which involve people and not vehicles. As such, we have deemed this to be the most versatile carport on our list. The first thing that will immediately stand out about the Quictent is that it is the only carport on our list to feature sides that extend all the way to the ground. Aside from the fact that this ultimately will protect your vehicle better – at least in the horizontal directions–than the Palram Vitoria, it also allows this carport to be more comfortable for housing people. That last part should not be seen as a forced function either. In fact, not only does the Quictent come with full-length sides, it also features 6 large windows, 3 on each side. These windows provide a more open, airy feeling to the carport should you use it as a place to gather during a party. Unfortunately, the windows do not unzip or open in any other way. This can present 2 problems: first, when using the Quictent to hold an event, you need to keep the door flaps open. Failure to do so will cause heat to build up in the carport rather quickly and make things uncomfortable for all people involved. Another concern about the windows involves durability. Ultimately, since the canopy is not a single piece, this necessarily opens it up to risk of greater wear and tear. Should you not properly care for the canopy when not in use, the window seals could come loose. Thankfully, the polyurethane walls are both waterproof and UV resistant. Moreover, should you not require the walls, you can simply set up the carport with the roof and not even put up the walls at all. Moreover, at a maximum height of almost 8 ½ feet, you will not feel cramped. 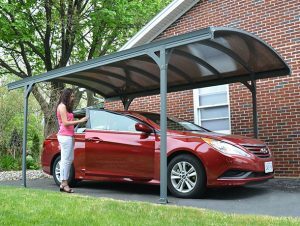 The next item on our list is easily the least expensive carport we reviewed. However, that should not be taken as a sign that this product is of a lower quality than the others. 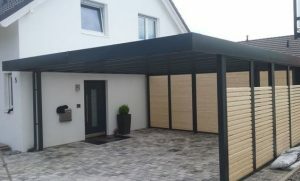 Still, you do need to understand the limitations of this carport before making a selection. Essentially, though it is the least expensive product on our list, it is also one of the less durable. This does not mean that the King Canopy will fall apart shortly after being constructed, but it was not made to stand the test of time for quite as long as some of the other products. 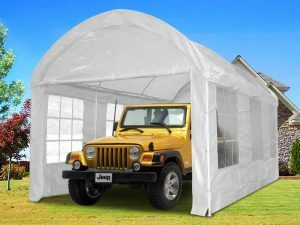 In fact, this product is probably best used as a temporary carport, better suited for a season’s use at a time than put up for half a year or longer. Part of this has to do with how the frame is constructed. While the frame uses steel like most of the other carports on our list, the steel itself is somewhat slighter than the other products. At 20 guage, the posts are not quite as thick as one would prefer. Moreover, the entire frame only employs 6 posts total. While the Palram Vitoria only provides 4 posts, it also uses polycarbonate sheets, whereas the King Canopy relies on a polyurethane canopy to provide protection. Another quality of the King Canopy that must be considered is its height. However, this presents a bit of a push-pull issue. The maximum height of the King Canopy sits at just under 9 feet–8 feet 11 inches to be exact. Unfortunately, the same cannot be said for the sides which only rise to a short 6 feet–again, 5 feet 11 inches to be exact. This means that the vehicle parked under the King Canopy cannot have a truly rectangular shape or else it will run the risk of hitting the frame. Therefore, even smaller campers are not truly ideal to park under the King Canopy which limits its versatility. Where the King Canopy ran into issues with height, the Abba Patio carries no such concerns. In fact, this is actually the tallest carport reviewed on our list – across different points of measurement. As such, if you have a wide vehicle that is also tall, this is likely your best bet. Still, there are other concerns in regards to the Abba Patio. One of the primary issues with the Abba Patio is the canopy. While the first product on our list featured polycarbonate sheets and the next two used a polyurethane cover, this marks the first product on our list to use a polyethylene canopy. While polyethylene and polyurethane are somewhat similar in chemical composition, their durability is not at all equitable. Oddly, the polyethylene is stiffer, but this counter-intuitively makes it less durable, not more. Essentially, the polyethylene material is able to absorb shock less than polyurethan. This puts the Abba Patio more at risk of tearing or being punctured by hail and debris. Moreover, this is also the only cover on our list to not be flame retardant. This means that if exposed to a flame, this canopy may very well light up right along with it. Generally, the materials of carport canopies will melt instead of catch fire. This presents a unique concern among the Abba Patio and definitely prevents it from being located anywhere near where one may be cooking, like with a grill. Thankfully, the canopy is the only part of this carport to really show signs of substandard durability. The frame itself features 8 posts all made from thick steel. 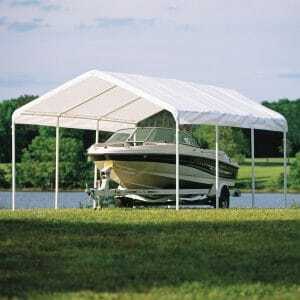 This provides plenty of support so that even if the canopy may not last as long, the frame is more than capable of keeping it up until you have to replace it. Our final product is also our biggest – on the ground measurements at least. While we would have preferred to see this size represented a bit more in the height dimension–easily the smallest average dimension on our list – the additional 2 feet of width more than the ShelterLogic’s nearest competitor does open up some possibilities. For instance, while it is generally not advised to try to park more than one vehicle under an aftermarket canopy along the horizontal axis as it increases the risk of hitting a support beam and bringing the entire carport down on top of the car, at 12 feet wide total, you may have some wiggle room here. 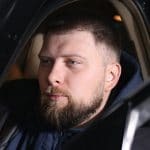 While it is still inadvisable to park two full-sized vehicles side-by-side, you should not necessarily feel the same aversion to parking a motorcycle, dirtbike, or ATV next to your vehicle. Granted, this will still require care and should not taken lightly, but it does offer more options than the other carports can provide. Another aspect of the ShelterLogic that is nice are its rule of 8s. First, the steel posts of the ShelterLogic are 8 feet tall. This makes the ShelterLogic one of the tallest carports on our list–though its maximum height is similar to the Abba Patio. Still, with tall posts, that provide more clearance for smaller campers and the like. Also similar to the Abba Patio, the ShelterLogic features 8 posts total. This provides more structural support than many other carports on our list. Unfortunately, much like the Abba Patio, the ShelterLogic’s canopy is also made from polyethylene instead of the more durable polyurethane or polycarbonate. 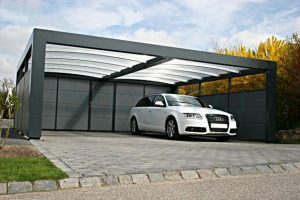 Moreover, this is the most expensive carport on the list that uses a canopy–second only to the Palram Vitoria which at least features polycarbonate panels. This is easily one of the most important aspects of a carport.Ultimately, the higher quality of the materials, the less likely you are to need replacing anything. This is especially relevant if your carport has walls. When you purchase a carport with walls, you get a bit of a discount on the different components. However, when you try to purchase different parts of a carport after the fact, most sellers will jack up the prices. 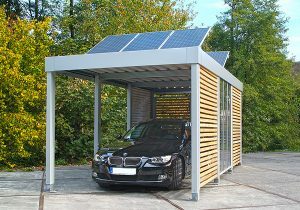 There are generally two different types of materials used for carports: metal and poly materials. Each of them has their advantages and disadvantages, so it is imperative that you understand what you need before purchase or you could end up with a carport that either does not cater to your requirements or costs far more than it should. Easily the most durable material is metal. Aside from the supports, metal carports are constructed from corrugated sheets of steel. These sheets are either layered upon one another like shingles or bolted to the steel posts, depending on whether you are referring to the roof or the sides. The corrugated steel sheets are much stronger than polyurethane covers, able to withstand the pummeling of hail and other objects. 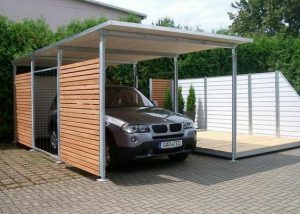 However, metal carports are also more expensive than the polyurethane covers, especially if you need to replace a sheet. Moreover, it is far easier to install a polyurethane carport by yourself with the aid of a friend than it is a metal one. In fact, if you do purchase a metal carport, it is advised to always rely on the professionals to install it–even if you are handy yourself. For most poly materials, the two main draws are the ease and the price. It should not come as a surprise that a cover of poly materials is much cheaper than machined, corrugated sheets of steel. Moreover, the polymaterials sheet is relatively light and can be installed with minimal effort–though you will need assistance. The cover of a poly materials carport can easily be removed and put away when not in use. This last bit is especially relevant if your carport is only used on occasion–for instance, if you have a summer cabin that you only use a couple months out of the year. The big exception to this rule is polycarbonate sidings or roofs. With polycarbonate, you get the best of both worlds. Polycarbonate is stiffer than either polyurethane or polyethylene, so it will better protect your vehicles. However, polycarbonate still comes in sheets. These sheets are much lighter than corrugate steel, but you are still advised to rely on professionals to construct the carport for you rather than trying to do it yourself. Outside of the materials, this is likely the next most important factor to consider. 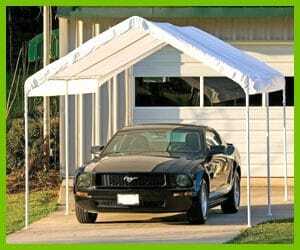 There is no point in purchasing a carport if the vehicle you wish to cover does not fit inside. While most carports offer x and y axis dimensions that will fit the widest variety of consumer vehicles, the z, or vertical, axis can be a bit more troublesome. This is especially relevant if you are purchasing a carport for a larger consumer vehicle, like an RV. Moreover, if you intend to setup your carport at a lakehouse or the like, you to be sure that it is long enough to cover both your boat and the vehicle towing it. In terms of standards, 20 feet is about the longest you can get without having to special order. Of course, if your needs call for it, the additional expense of a special ordered carport will more than make up for it with the assurance that the entirety of your vehicle is protected. Keep in mind, for single vehicle carports, you can find carports as small as 10 to 12 feet long. Width is also important, though this dimension is even more standard than length. 10 feet wide is the dimension most carports will come in, though every now and then you can find one that gooses the carport’s width a couple feet either way. Keep in mind, while it may seem tempting to do so, prefab, aftermarket carports are not designed to house two vehicles side-by-side. If you own two super compact cars, like two Fiats or two Smart Cars, you may be able to get away with it. However, trying to house two vehicles side-by-side in a single aftermarket carport opens you up to the possibility of hitting one of the supports while trying to maneuver the vehicles within. Instead, simply purchase a separate carport if you need to house multiple vehicles side-by-side. The final dimension is arguably the most important: height. Ultimately, if the carport is not tall enough to comfortably house your vehicle, then you basically just wasted your money. The minimum height you should look for is 8 feet tall. Unfortunately, due the various designs of carports, that height dimension may be measured at the carport’s tallest point or at the shortest. Therefore, when judging the height of a carport, always select the height of the steel posts–do not simply look for the tallest point of the roof as that may not be an accurate representation of its functional height. Aside from the material, another consideration is whether or not the carport protects both itself and your vehicle more than most. 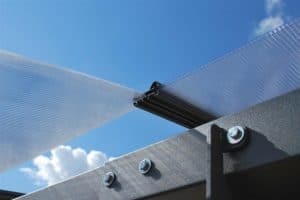 In regards to protecting itself, you will want to look for steel support beams that are either powder coated or in some other way protected from rust and corrosion. Should the carport utilize a canopy, this canopy should be UV resistant and waterproof. Ideally, the canopy will also be flame retardant, though that is not necessarily a given. The canopy may also be pulled down the sides of the carport to offer protection from debris blown by strong winds or even animals. While most carports features steel beams as their support, the thickness of the steel will help determine the quality of the support. Steel beams which are less 18 gauge and preferably not less than 16 gauge are somewhat thin. This does not mean that a 20 gauge steel support will fall over, but it definitely will show signs of wear quicker than others. 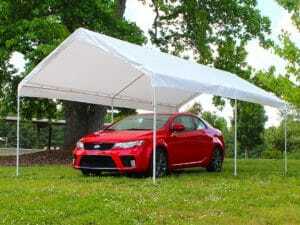 Moreover, if it is being used to secure a canopy, the canopy itself might not fare as well in stiff winds. As we can see, which carport is the best will hinge more on what you need from it than any inherent quality in the carport itself. 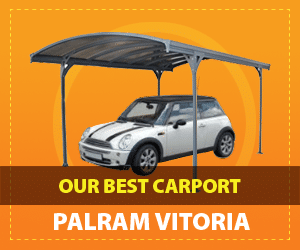 For instance, if you are looking for a more permanent carport, you are better served going with the Palram Vitoria and its polycarbonate panels. Of course, the Palram Vitoria is rathe small, best suited for a single consumer automobile. If you need something a bit bigger, both the ShelterLogic and Abba Patio offer a good mix of different dimensions that are larger than most and will allow a wider variety of vehicles to be adequately protected. If you would like to host a party with your carport or ensure that your vehicle is protects on all sides, the Quictent’s walls are likely to be an attractive feature. 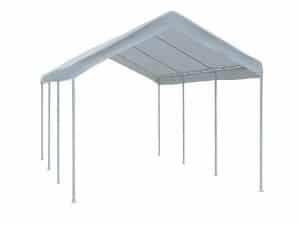 And finally, if you simply require a temporary carport for a season or two and are not looking to invest much, the King Canopy where you should look. Your top picture with the Mustang is exactly what I am looking for my truck. I live a little SE of Seattle, I want to use it all year on cement driveway. I am thinking about securing it, wind factor and durability.